Great shots, looks like a wonderful day at the beach and then home to a very nice treat! I love the smell of roast chicken, so homey. I felt the cold here in KY, just wish I could have seen the sights you have shown. beautiful mosaic..lovely words to describe your walk...we did a walk out here in Langley today...brisk wind here also..have a good Monday.. Wonderful set of images from the beach arranged nicely. A beautiful arrangement of these lovely images. I always enjoy your mosaics, Lorrie, and your words paint a picture as vivid as those taken by your camera. Very chilly looking and beautiful. The blues are particularly wonderful. Glad that you had a hot meal waiting for you at home. It sounds like the perfect way to end a cold walk. Oh to walk on the beach, what a joy! Hubby and I only get to do this when vacationing. My daughter gave me some cute earrings made from sea glass. Wonderful what a bit of sand and water can do to a piece of broken glass. I feel like I'm there with you. What a great day, a walk on the beach and finding some sea glass. Love the photos and mosaic. Have a Happy week! Like you I love beach walks, whatever the weather. 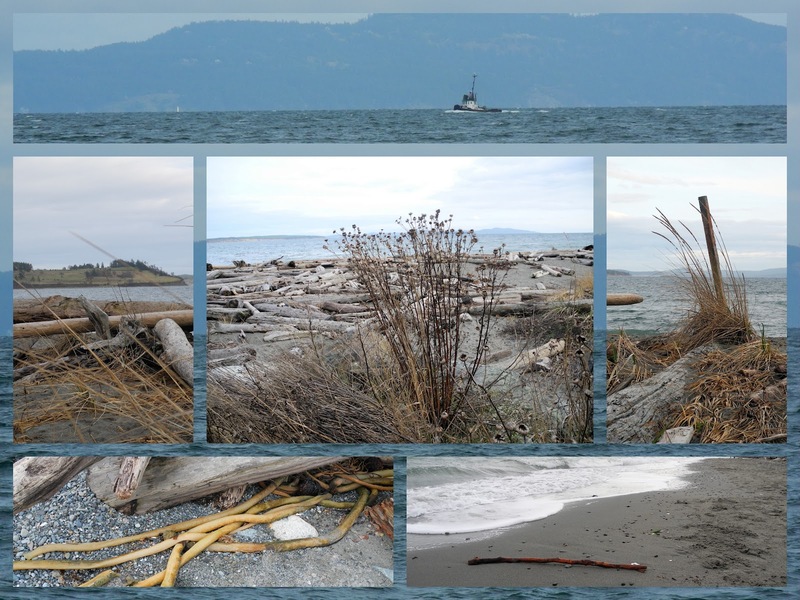 Great shots of the flotsam & jetsam washed up by the waves. Tu as de la chance de te promener au bord de la mer ! ça me manque beaucoup et vu mon niveau de fatigue, ça me ferait beaucoup de bien ! Tes photos sont magnifiques (comme d'habitude). One of my favourite things about childhood was playing outside in the cold and coming indoors to the aroma of my mom's roast in the oven. Your chicken would have been just the thing after a chilly, but beautiful, walk. What a pretty and calm beach. We don't see much driftwood on the Jersey Shore or seaglass any more. There is something so very serene in the colors of these pictures...just lovely! Beautiful. Thank you. . . Sigh! We should all walk on the beach...at least on occasion. While organizing my studio I found a bag full of sea shells and driftwood I collected while visiting Vancouver. I would really have loved to join you. It's just the sort of bracing walk I like. The hills are not quite the same. The wind takes your breath away and I'm left panting uphill. wonderful imagery in both your words and images - just wonderful - so do you do a lot of creative writing? You should! You have a way with words. Just lovely. The beach can be a wonderful place in winter, as you have shown us. Have a wonderful week and thank you so much for stopping by my blog to say hi. What a fantastic day to walk along the beach on a day like you describe so poetically. It really is a workout to walk along those stones in a strong wind. I'm sorry it wasn't warmer for you...I enjoyed the armchair walk!